Here we look at the use of paint and wall paper in the Victorian and Edwardian dining room, carpets, curtains, and lighting; the decorative details. Victorian and Edwardian dining rooms tended to be decorated in a British style rather than with French or Far Eastern patterns. Until the 1840s, dining rooms had a light décor, embodying the light and delicate lines of the Regency style. 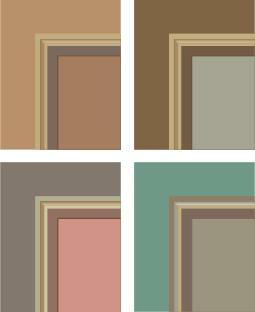 From the mid-Victorian period onwards, colours tended to be sombre, warm and rich such as dark maroon and sage green. Wood was chosen to match, such as mahogany. The peak period of rich colouring was with the Gothic revival. 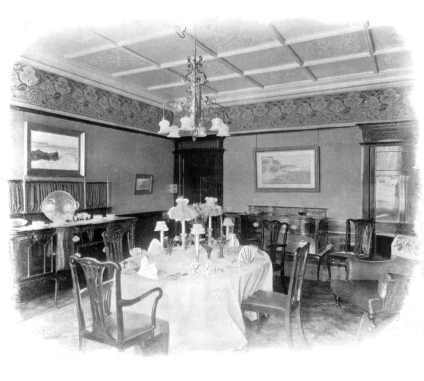 In general, throughout the Victorian and Edwardian eras the dining room had a richer feel than the feminine drawing room. Whereas today most people use the larger room at the back of the house as the 'dining room', in earlier times it was at the front. In many original plans of Victorian and Edwardian houses, the dining room is shown at the front and the drawing room at the rear. Perhaps this custom was because the dining room was not just used for dining; it was 'the man's room', used for other activities, including meeting guests. The décor was therefore intended to impress yet also be practical. In most homes throughout the Victorian and Edwardian periods, the ceiling was papered with a relief paper, painted either off-white or using a tint of the main colour. Only in the most extravagant Gothic dining rooms were very rich colours used. The cornice and rose were often painted in several colours to highlight the moulding. Gilding was sometime used. Woodwork, including doors, architraves, skirtings and picture rails was dark, even black. In the early Victorian period, wallpaper was still expensive. More affluent homes would have used silk or paper as a wall-covering, but in other homes paint was used. Cheaper roller-printed wallpapers were available from the late 1830s, and by the 1870s these were cheap enough for every room in house. By this time wallpaper was ubiquitous in Victorian dining rooms. Until the Gothic revival, sprig pattern and moiré wallpapers were popular. One also saw trellis designs and patterns imitating swagged textiles or painted panelling. In the middle decades, flock and velvet wallpapers became very fashionable. 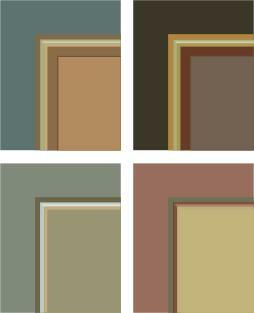 These heavily patterned papers in dark greens and burgundy were used above the dado. These papers had complicated designs, often with geometric patterns. Henry Cole, the superintendent of the Great Exhibition, encouraged the use of rich colours through his journal. The next fashion was for wallpaper patterns incorporating scrolls, vines and birds. These designs were generally small-scale and finely detailed. William Morris-style patterns of flowers and brambles as well as tapestry designs were popular. Leather papers and embossed papers such as Lincrusta and Anaglypta were used on the dado, frieze and even the ceiling, dark painted for the dado and lighter above. Owen Jones argued against pictorial papers and three-dimensional designs and the second half of the 19th century saw a very gradual simplification. Where this call was heeded, the dado was removed. Flat paint and stencil patterns above dado and below picture rail were used. The picture rail and frieze would be painted white or using a tint of the main colour. However, the supporters of the Aesthetic and Arts and Crafts styles kept the tripartite division. In the 1890's, the wallpaper was a large-patterned, floral design, with a pictorial frieze, and the ceiling would have had a relief pattern paper. 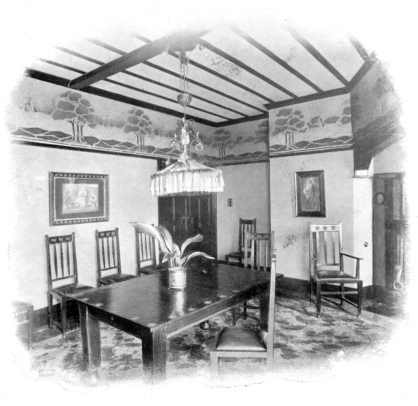 The Arts and Crafts movement led to a lighter, more feminine style for the dining room. Art Nouveau styles brought olive and sage greens and mustard yellows for walls with stencilling and friezes in organic shapes and stylised birds and foliage. The frieze was often decorated with a special frieze paper, or with a painted or stencilled mural. Stencilling became very fashionable in the Edwardian period. By 1900 the dado was out of fashion for all but the hall, stairs and landing, and the picture rail was lower, perhaps on a level with the top of the doorway. And so there are two divisions to consider. The dining room still tended to have rich, dark colours, for example red and brown paper, or paisley stripes. The room was often used for pictures and a dull red, green or blue made a good background for oil paintings. By 1910, middle class rooms had taken up the call for less clutter and more simplicity in decoration; the wallpaper would have had a plainer pattern or walls were just painted. However, this fashion took longer to appear in lower class homes. The frieze would be painted white or using a tint of the main colour. It was often decorated with a special frieze paper, or with a painted or stencilled mural. Stencilling became very fashionable in the Edwardian period. The ceiling would often be papered with a relief paper, painted either white or using a tint of the main colour. With the Queen Anne revival the ceiling rose disappeared in exchange for more elaborate fibrous plaster ceilings once again, particularly as manufacturing processes had reduced the cost of 'kits of parts' of cornices and mouldings. In the middle years of the 19th century, wall-to-wall carpets were fashionable, but outside this period there would be a central carpet, with the surrounding floor boards painted or stained dark and varnished. The skirting would be a in similar finish. Carpets were in elaborate designs with flowers and foliage, often in light colours, or else Turkish rugs and carpets were popular in the later decades. "Curtains give such an air of comfort to a room, whether it be to the spectator from without, or to the occupant within, that we could wish no cottage, however humble, to be without them. For the same reason, we should wish cottage windows to be large, that the curtains may be displayed without too much obstructing the light." Summer curtains would be of white muslin whereas rich fabrics such as velvet and silk were used during the winter. The curtains hung on heavy wooden or brass poles and were tied back with ropes or metal fittings, decorated with tassels, ribbons and festoons. The fireplace would have a richer treatment than in the drawing room but and had a cloth drape, probably in a dark colour as it would have needed washing frequently. Lighting would typically have been provided by gas wall lights, and candlesticks on the table.